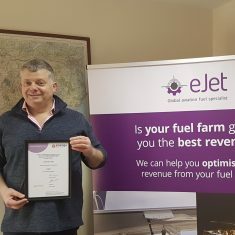 We are delighted to announce that John Pitts (eJet Internationals’ Managing Director) has recently been elected as a ‘Fellow’ of the Energy Institute. Below we talk to John about the the achievement. Is this something you have wanted to achieve for a long time? Yes, because it is a form of recognition. I’ve worked in the Aviation Fuel industry for more than 30 years now. Running a small business in an industry dominated by larger players, I feel that achieving the Fellowship is an important marker that demonstrates that I have achieved certain things and that this has been acknowledged against a measurable set of criteria, which is very pleasing. What contribution do you consider you have made to the Aviation Fuel Industry? Over the 30 year period our industry has changed considerably, with the major oil companies no longer being involved in the supply chains in the way that they were in the 1980s. This has meant that as well as opening up opportunities for other players, the changing relationships within these supply chains require expert involvement to ensure that gaps are closed and that there is an unfailing supply of fuel to end users – the airlines. In our case as an example, the emergence of Open Access Fuel Supply has played to one of our core strengths and we’ve been able to implement this commercial structure to the advantage of our clients in a number of high profile cases. How do you see your future involvement with the industry evolving? Looking to the future we see continued change to be the order of the day. I am looking forward to being at the forefront of managing that change -and responding to the opportunities so created -with innovative solutions that protect our clients’ interests and maximise their advantage.